I must say that I have been a really good girl last year for being able to talk myself out of buying more dolls (just to eventually ignore them). And I'm proud at this! Today, I'll be sharing photos of my gals who joined the atelier in 2015 --- sporting some of the creations I made also during that year. I hope you enjoy, dollies! Ella is a Barbie Style gal who started modeling for the atelier around the middle of 2015. Love her clean makeup, articulated joints and flat foot. Here she's wearing a beach outfit from summer 2015 that turned out to remind of the Mexican soap operas that I watch when I was a child. This is Luna, a Barbie Fashionista wearing the Midnight Daisies sun dress I released around August of last year. I love that Luna only smizes and that she is a copper head - another unique gal in my collection. And up next is Sari, that Kira girl from the 80s that has me smitten. I guess this is because her hair color and skin tone remind me of my friends, my beloved Filipino people. I have named her after my maternal grandmother Lola Rosario. Here's one of her photoshoots. Then came Milka, previously Grace Kelly in Barbie Basics body, whom I have been rooting for in a long time. I just adore that face, so so elegant. I may give her a reroot this year, and hopefully a rebody to an articulated one. Here she's working one of my 2015 star bestsellers - the distressed denim shorts, paired with the comfy raglan chunky sweater. Then while I was just passing by the community mall to check out something else other than what's been added in the Barbie shelves (LOL), this bright-eyed lady called me up. And there I go, off to the counter to swipe my card LOL! Chiara is currently on Raquelle's fashionista body, which is almost the perfect skintone match. Yes! Here she's sporting a GNO outfit because that's what girls who so work hard do - play harder! And how can you say NO to this face? Tell me so... And those lustrous locks? and edgy pose? Oh, geez, when will this end? LOL! Kidding aside, Yoko here, my last doll purchase of 2015 is wearing the Amy dress, a dress I designed in summer 2015 in honor of my favorite music artist Amy Winehouse. Yup, only 6 dolls! I could have included Fame Fable Kyori Sato that I ordered in July 2015 but she has not arrived yet so she will have to be in the 2016 list. And here are some more photos for you.. Thanks so much for making our 2015 the best year yet, dollies! The ladies are styled so nicely! I love love your fashions!! Did you make the tee shirt in the last pic (lavender one)? I so enjoyed the outfits & the girls. They look so good. I have enjoyed re-visiting your fashions. You really do inspire me to sew more so I am going to try. I will be sending you and email soon! Great dolls and beautiful clothes. Congrats! Hi Linda.. Thanks very much, dear. Actually, I still have some outfits that are not included in this shoot like the beach-y ones and the ones I have ran out of for my girls. Yes, that Mexican one looks great on Ella =) I think I still have a few of that outfit in my stocks, I just forgot to relist if you can't find it in my shop. I gotta do inventory soon haha! Thanks for reminding me, dear.. 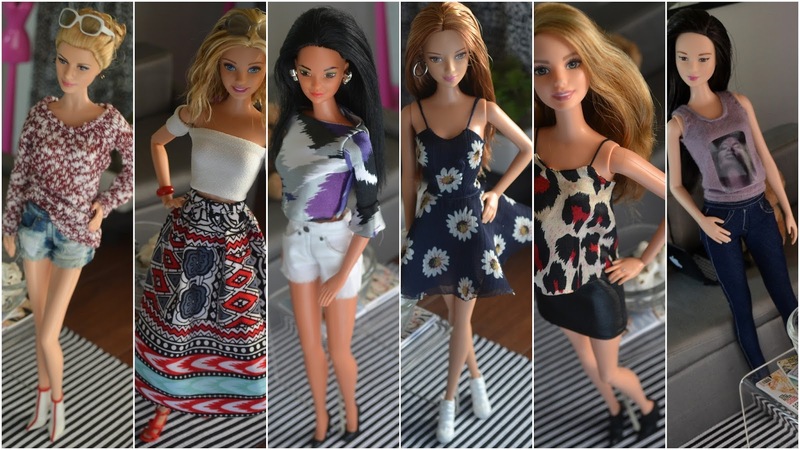 I love the dolls *almost* as much as I love the fashions. I need to add your Etsy shop to my favorites. I'm a sucker for red heads, so I adore Luna. I agree 100% that Yoko has a face that one just can't say no to, and I also bought the doll you've named Chiara. There was just something about her face. I, too, noticed that the Fashionista Raquelle body was a near perfect match for her. Mine is still awaiting her body transplant. Thanks so much for the kind words, Jewell. That's awesome we have so much in common (in doll stuff, at least!). I'm glad to be able to borrow bodies with Raquelle, as this skintone of Joyce (my Chiara) seems like a new blend, am I correct?